Today I downloaded: A hat! Okay, full disclosure, I actually downloaded this last week. But “Sometime last week I downloaded a hat and I’m almost done with it” is a really long title for a blog post. This project is more about the story behind it, though. My brother is a gamer. Not a video gamer and not a Dungeons and Dragons” style gamer. His hobby is hard-core tabletop gaming. He paints models for some of these games and has been known to play games that could take entire weekends. It’s not a surprise that Fidgety Brother is a well-known regular at a game shop near his house. Interestingly enough, this game shop is run by one half of a married couple. The other half of the shop is run by the wife of the pair. It’s a yarn shop. My brother is enough of a regular that he is known on this half as well (apparently you have to walk through the yarn shop to get to the game shop). Right before Christmas, my sweet brother walks into the yarn shop. There is a group of “older knitters” (knitting and chatting as we are wont to do) and the owner catches Fidgety Brother’s eye. Which he really did as my brother has no idea how to purchase yarn. So he trusted the yarn shop owner and she did not let him down directing him to the beautiful Malabrigo worsted pictured above. I love working with Malabrigo so this was a perfect purchase (thank you, trusted yarn shop owner!). It was, however, only one hank of worsted which limits the projects I could make with one ball of yarn. I kid you not, the day after I received this yarn I opened up Instagram and the very first image I see is a gorgeous hat knit from Malabrigo worsted (seriously, follow their account. So many pretties). Isn’t that beautiful? 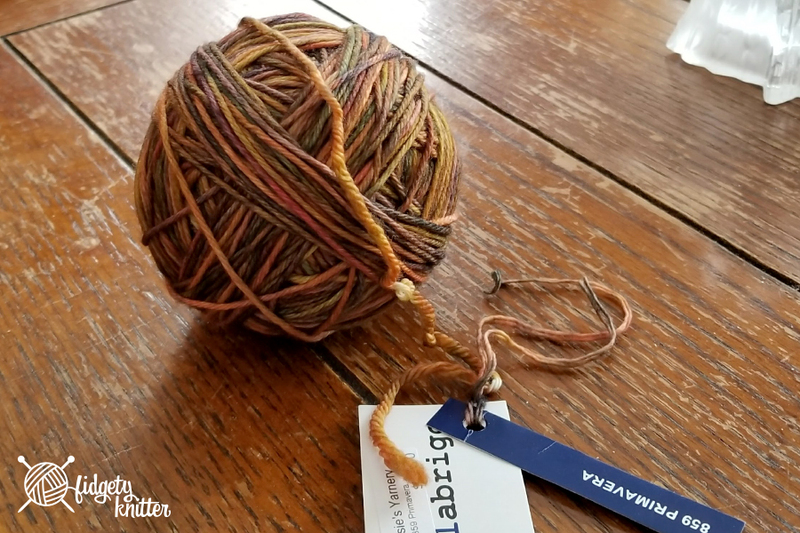 And, yep, one ball of Malabrigo worsted. Pattern downloaded! The Copy.Cat C.C beanie by Emily Ingrid is a free pattern and has been knitting up very quickly (though, ugh, lots of purling!). There isn’t a gauge in the pattern and I think I’m knitting mine up a little tight. While the other images have a more slouchy look to the hat, mine is more fitted. But this is knitting up really beautiful and I can’t wait to see it finished. With 2018 underway, what do you have on your needles to start the new year? Share your patterns in the comments! I did not know this yarn store/game shop combo existed…. Isn’t it perfect, though? Certainly on my “to visit” list now! I will need to see pics of that hat for sure when you’re done. As you may have seen on Facebook, I am working on the pattern Kells by Lucy Hauge. It’s fabulous for people who love cables. When I was finished with my Christmas knitting I cast on a pair of Hermione’s Everyday socks for myself using Greenwood Fiberworks Yakity Yak yarn. I was almost ready to turn the heal on the first sock (after a false start or two), but when I was looking at a video that a family member sent, I noticed that she had a bit of a baby bump going. Though there was no official announcement made, I put aside the socks and started a baby blanket. Just in case. So much for selfish knitting.